By default, Canvas allows students to see assignment grades as soon as the instructor has graded the assignment. In some cases, instructors may wish to hold student grades until all assignments have been graded, and then release grades to all students at the same time. To hide student grades temporarily, an instructor can choose to mark an assignment as muted. Students can still see and submit a muted assignment. Only the grade will be hidden. 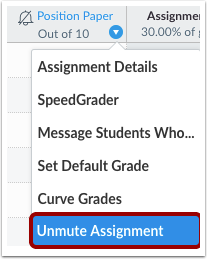 You can also mute assignments in SpeedGrader. 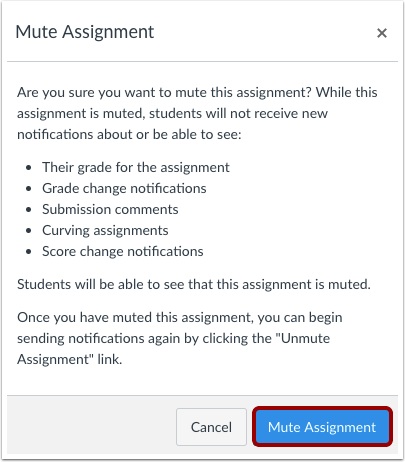 A muted assignment will not send out grade change notifications or any new instructor comments until the assignment is unmuted. 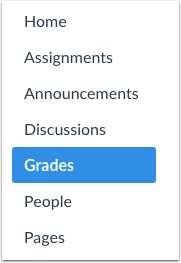 A muted assignment displays a Mute icon on the student grades page so students know the assignment is muted. Students will be unable to view their grades, including grade and score changes, instructor submission comments, Canvas DocViewer comments, and curved assignments for the assignment, until the assignment is unmuted. 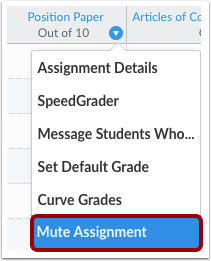 In Gradebook exports and reports, muted grades are part of unposted grades. If you do not want students to be able to view their total grade, you can hide the total grade from students. If you make changes to a muted assignment, the total score as you see it (in both the Gradebook and the student Grades page) will be affected. However, students will not see any changes when they view their Grades page. 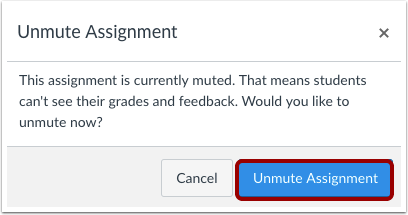 Once you unmute the assignment, the total grade in the student's view will update accordingly. Anonymous and moderated assignments are muted by default. Moderated assignments cannot be unmuted until final grades have been posted. If you unmute an assignment with varied due dates, all students will receive score results at the same time. Viewing the Total Column in the Gradebook may be restricted when multiple grading periods are enabled. Students will not be able to see their quiz responses while a quiz is muted. Hover over the name of the assignment. Click the drop-down menu. Click the Mute Assignment link. Click the Mute Assignment button. View the muted icon for the assignment . In the Total column , the Gradebook displays a mute icon, warning that your grade view is different from the student's grade view because of the muted assignment. The Total column only displays graded assignments that have been muted. Assignments that are set as Not Graded are not affected. To unmute the assignment, click the assignment drop-down menu and click the Unmute Assignment link. Note: Moderated assignments cannot be unmuted until final grades have been posted. Click the Unmute Assignment button. Previous Topic:How do I curve grades in the Gradebook? Next Topic:How do I view a student's Grades page in a course? Table of Contents > Grades > How do I mute or unmute an assignment in the Gradebook?